Hyundai’s Genesis brand is serious about becoming a real rival to Germany’s three dominant luxury car brands. To that end, Genesis just debuted the G70, its answer to the 3-Series, C-Class, and A4. It joins both the mid-size G80 and the full-size G90 to complete the Genesis sedan lineup. The G70 is based on the same rear-wheel drive platform as the new Kia Stinger, but opts for more subdued luxury-car styling in favor of the Kia’s sportier look. It gets the same engines too—a 2.0-liter turbo four that cranks out 255 hp, and a 365-hp turbo’d 3.3-liter V6. Genesis will also offer a 2.2-liter diesel for the G70, but it’s unclear if that’ll come to the US. Oddly, Genesis didn’t mention what sort of gearbox the G70 will receive (we’ve reached out to find out), so, for now we’ll assume it gets the same eight-speed automatic that’s in the Stinger. Genesis says a top-of-the-line V6-powered G70 Sport runs from 0-62 mph in 4.7 seconds, which is damn impressive. The G70 also gets launch control, torque vectoring, multi-link rear suspension, and promisingly, a mechanical limited-slip differential. Since the G70 has to contend with the lovely A4 and C-Class, it gets a nice-looking interior too. There’s quilted leather found throughout and a center-console that’s angled towards the driver—just like you’d find in a 3-Series. The G70 gets all the active safety features you’d expect from a luxury car too. 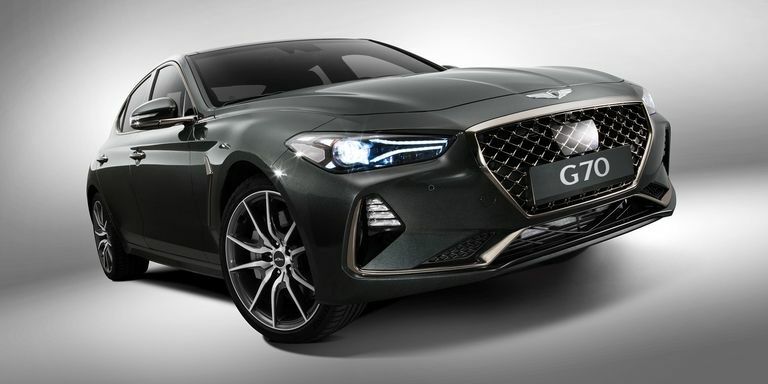 US-market G70 specs will be announced some time early next year, but already this looks like a promising car. It sounds like Genesis is serious about making something that’s luxurious and fun to drive, but it’s in a very tough segment. We can’t wait to see how it stacks up.